‘Tis the season to try one of these projects. We might be well into October, but for many of us, it’s just begun to feel like fall. Cue the pumpkin-spiced everything, cozy knits, and home-screenings of Hocus Pocus. WeAreTeachers is celebrating cooler weather and the changing foliage with 12 awesome leaf crafts and activities. 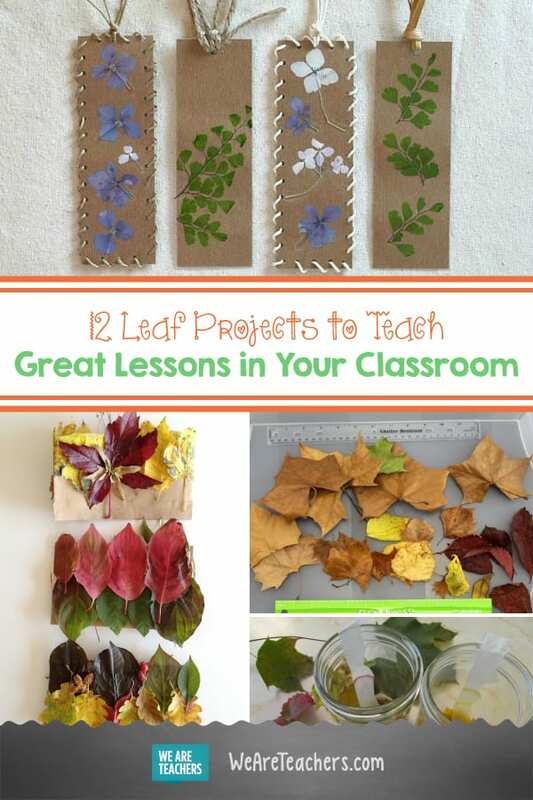 Read on for leaf-themed activities you and your students will absolutely fall for. Although this activity is relatively simple, it can serve as a great gateway into a science lesson about leaves and other plant life. As your students create their leaf rubbings, ask them questions about why they think leaves change color in the fall, whether they know of other plants that change color with the seasons, and if they can name the different parts of a leaf. Get more tips for this project from All Things Mom. Just when we thought fall couldn’t get any cozier, we discovered this awesome craft from Red Ted Art. Challenge your students to collect as many different leaves as they can find either at home or on the playground and try to identify the leaves once they’ve constructed their lanterns. 3. Hang leaf garlands in your classroom. For a super simple (and clean!) 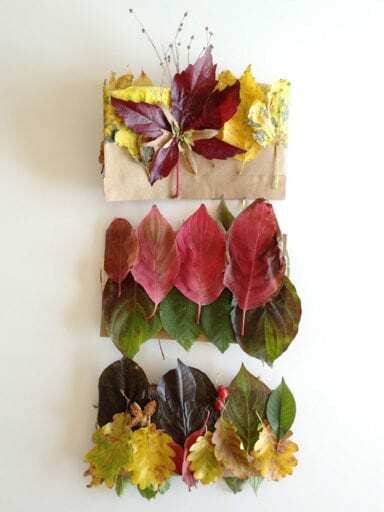 classroom activity, create leaf garlands for your windows with autumn leaves and Scotch tape. This is a great team activity for your students that can lead to a discussion about leaves, sunlight, and the process of photosynthesis. Up for more of a challenge? 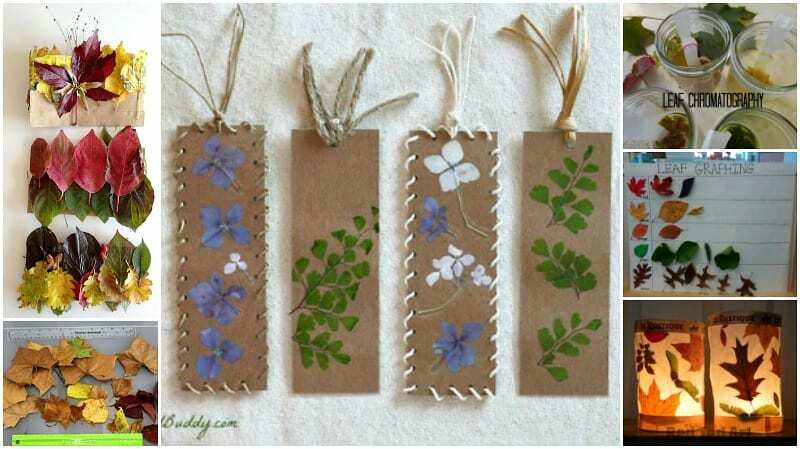 Have your students use a needle and thread to sew their leaf garlands before taking them home. 4. Count out leaves on a graph. This is the perfect activity for a math class. Have your kids spend a few minutes outside gathering leaves and then, working in groups, sort the leaves by shape or color and create a leaf graph with their findings. You can follow this activity with a lesson on fractions or percentages, based on how many leaves in each shape or color your students gather. 5. Measure and sort leaves. Another math (and science) activity, measuring and sorting leaves according to their size is an awesome way to get your students thinking about numbers while enjoying the fall season. Adapt this project from Inspiration Laboratories for older students by asking them to order their leaves from smallest to largest and calculate the difference in size. 6. Make (and wear!) leaf crowns. Just in time for Halloween, these woodland crowns from Handmade Charlotte are the perfect way to embrace the fall foliage. Use this activity as an opportunity to talk about different leaf shapes, colors, and textures. Salute the season at story time with books about fall and the changing leaves. Some of our favorites include There Was an Old Lady Who Swallowed Some Leaves, Leaf Man, and The Little Yellow Leaf. 8. Teach personification with Leaf Man. Head’s up: This particular craft takes a couple of days, as you’ll need to allow enough time to press the leaves, but the result is worth the wait. (The pressing process will take less time if the leaves are already dry.) As your kids work on their bookmarks, talk to them about the importance of caring for books and how to develop good reading habits. 10. Write poems on leaf-print paper. Your kids will love this hands-on approach to writing. Follow the tutorial provided by Remodelista then instruct your students to write a short poem about fall on the paper they’ve designed. Encourage them to include words like “autumn,” “change,” “season,” and “leaves” in their poems. 11. Work on writing descriptions with the All About My Leaf worksheet. Have your students find one leaf that interests them before completing this worksheet from The Mailbox. Adapt this activity to the age and writing abilities of your students by adding more writing prompts, asking your students to name the color of the leaf themselves, or asking them to come up with three good adjectives to describe it. Teach your students about color pigments in different leaves by conducting this cool (and colorful) chromatography experiment from Teach Beside Me. As with any science experiment, ask your students to craft their hypothesis about what will happen at the end of the chromatography process and then record the results. Have some leaf crafts or activities of your own you’d like to share? Let us know in our WeAreTeachers HELPLINE group on Facebook. Plus, check out these Thanksgiving craft ideas.